You’ve always wanted an outdoor entertainment area, but your small landscape barely has enough space to host a family of squirrels. Before you resort to flipping burgers on your stove-top and playing swing ball in the living room, you should browse through these deck and patio ideas for small backyards. At Paul Construction, we specialize in smart designs that help our customers squeeze more out every square inch of their outdoor spaces. Our pros will visit your home, evaluate your property, and advise you on the best way to transform your landscape into an idyllic retreat. For more than 25 years, our crew has been raising the bar for hardscaping services in New Jersey. To schedule a visit from a member of our team, call 610-287-1623 and ask for Paul. Homeowners with large landscapes have the luxury of building expansive decks and patios without having to think about storage solutions. But with small a backyard, access to built-in storage is almost as vital as having space to entertain friends and family. Fortunately, deck and patio storage can be incorporated seamlessly as part of the design. We can use elements of the deck or patio structure to disguise or hide drawers, lockers, and cupboards. New Jersey’s winds can wreak havoc on outdoor seating, causing your favorite garden chair to relocate to your neighbor’s prized flowerbeds. Including deck seating as part of your new deck or patio design not only will alleviate the headache of fishing your furniture from ponds and fronds, but it will also help maximize space while minimizing clutter. A deck or patio that dwarfs your backyard is only going to look awkward. By the same token, an outdoor entertainment area that is too small will disappear into the greenery of your landscape. Finding the right proportion is a tricky equation that requires decades of experience and accumulated knowledge. Fortunately, our pros have spent more than 25 years transforming outdoor spaces, equipping them with the training, expertise, and tools to design and build a patio that will complement both your home’s architecture and landscape. Want more deck and patio ideas for small backyards? The team at Paul Construction can design the perfect entertainment area for any space. Call 610-287-1623 today to get an estimate. 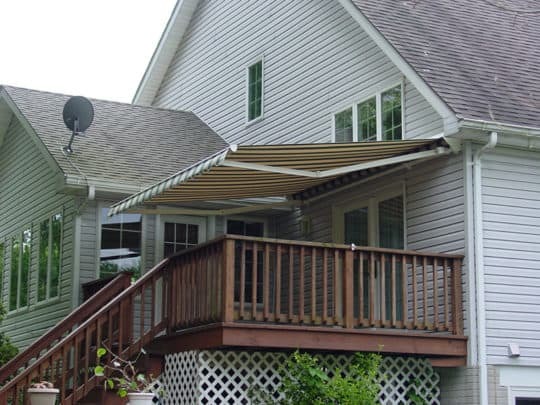 ← Looking for Custom Awnings Near Me? Why Choose Us!